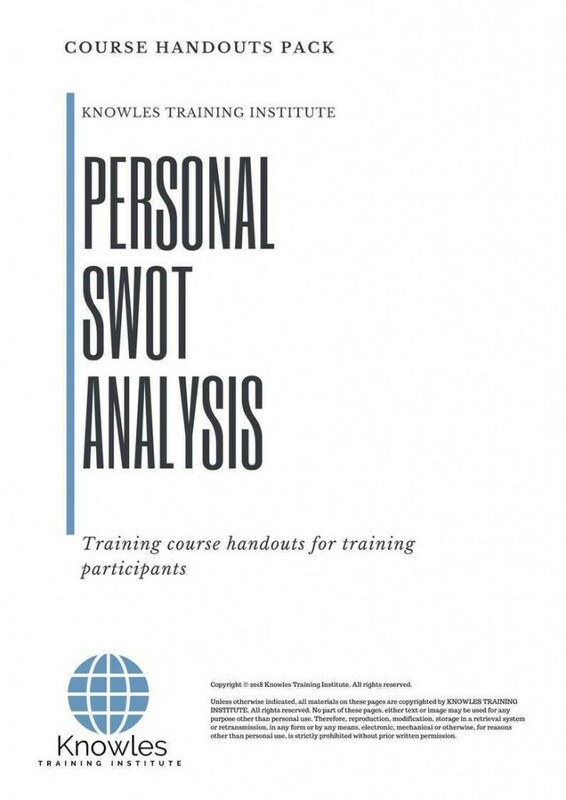 The SWOT Analysis, thought to be developed by Albert Humphrey in the 60s, is a universal tool to help a person or an organization in achieving a set of goals by defining their Strengths, Weaknesses, Opportunities, and Threats, interpreting the input data correctly, and providing methods on how to achieve them. The four parameters could be divided into two categories: (1) internal factors which include strengths and weaknesses that could be controlled by a person, and (2) external factors which include opportunities and threats that could come from the outside environment. This method has been used since its conception largely for management and business strategizing. A Personal SWOT Analysis focuses only on a single person’s assessment and desired outcomes. It helps him/her come up with a concrete strategy to achieve them. 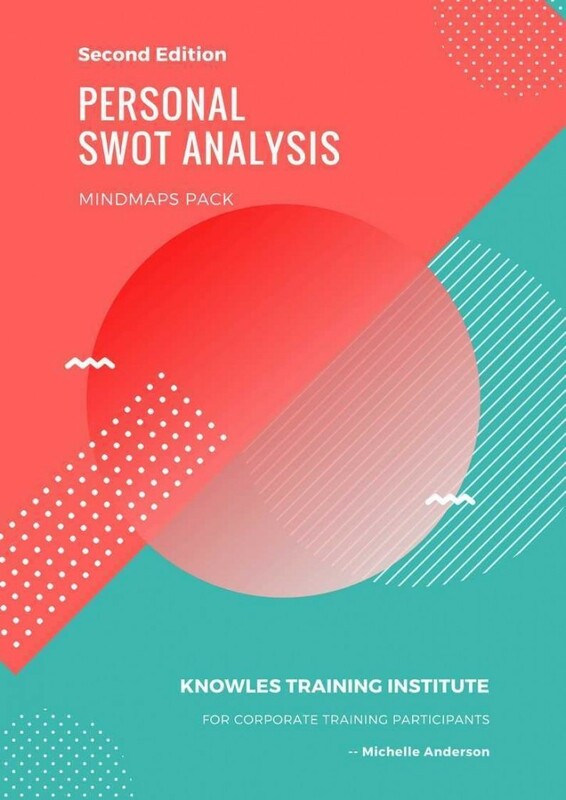 This course will aid the participant in designing his/her own SWOT Analysis for future decision and strategy-making, as well as correctly interpreting the data that was input. This Personal Swot Analysis workshop is ideal for anyone who would like to gain a strong grasp and improve their Personal Swot Analysis. The duration of this Personal Swot Analysis workshop is 1 full day. Knowles Training Institute will also be able to contextualised this workshop according to different durations; 2 full days, 1 day, half day, 90 minutes and 60 minutes. What is the purpose of conducting a Personal SWOT Analysis? 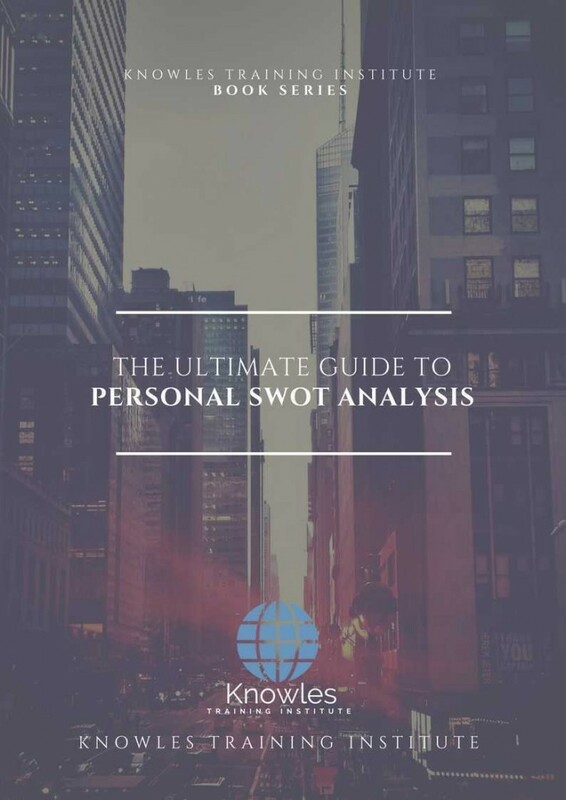 When is the best time to conduct a Personal SWOT Analysis? 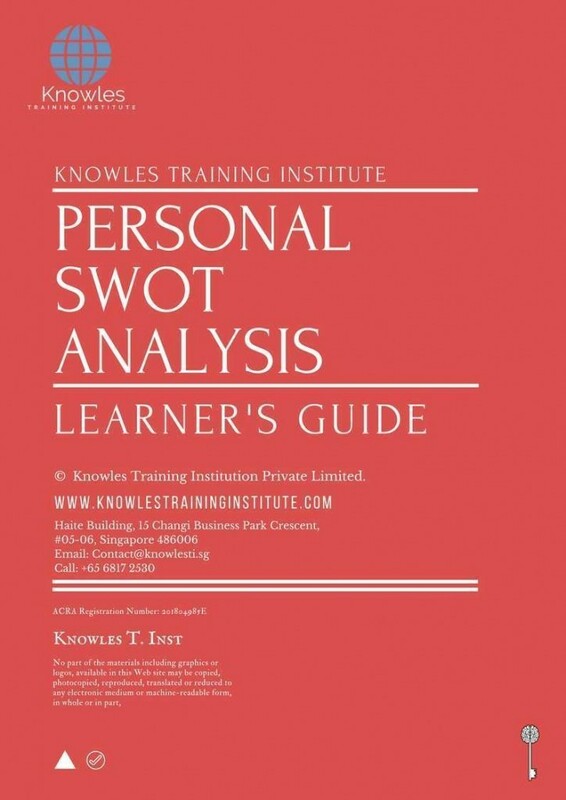 How can you determine the outcome of a Personal SWOT Analysis? 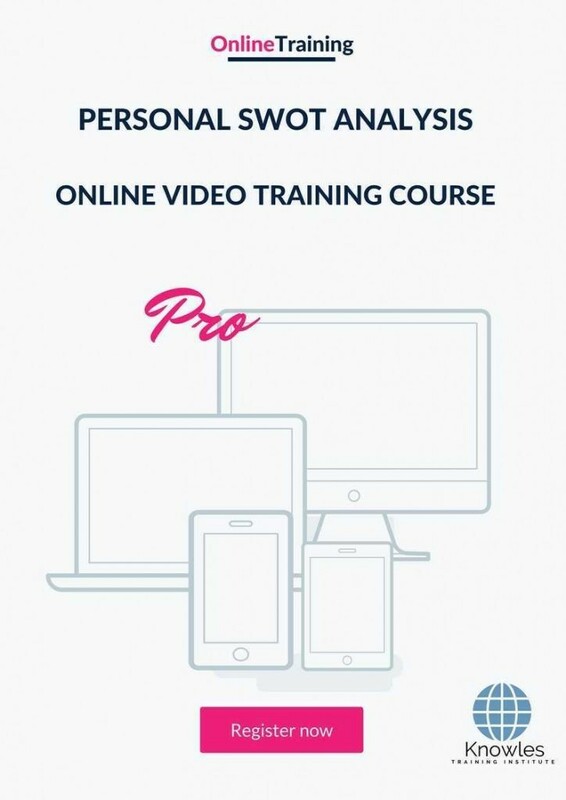 There are 3 pricing options available for this Personal Swot Analysis training course. Course participants not in Singapore may choose to sign up for our online Personal Swot Analysis training course. 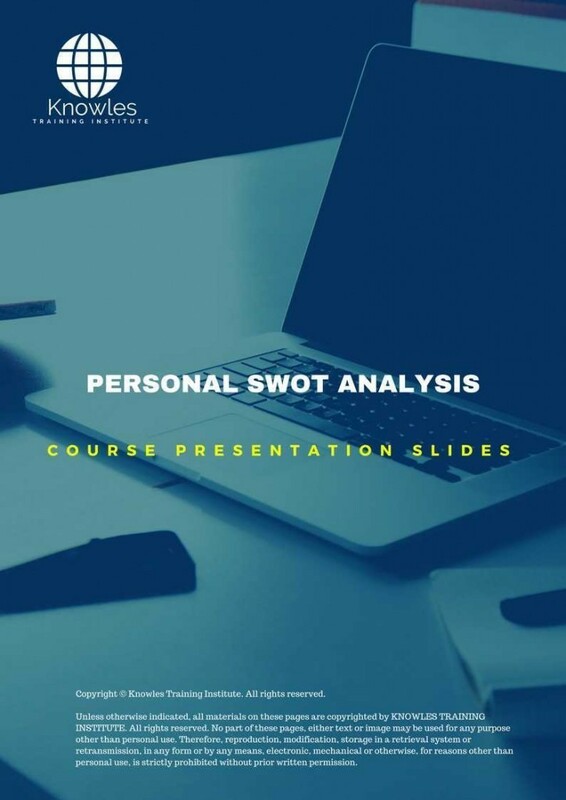 Request for this Personal Swot Analysis course brochure. Fill up the short information below and we will send it to you right away! 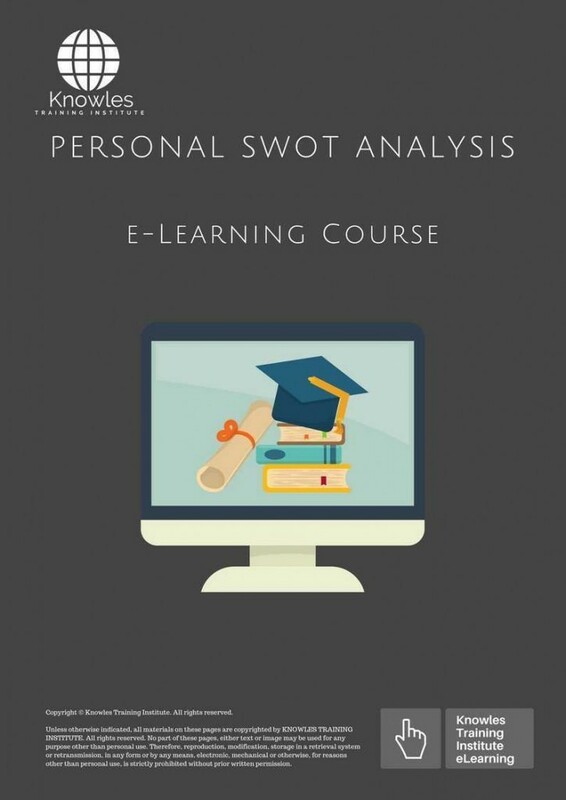 Register For This Personal Swot Analysis Course Now! 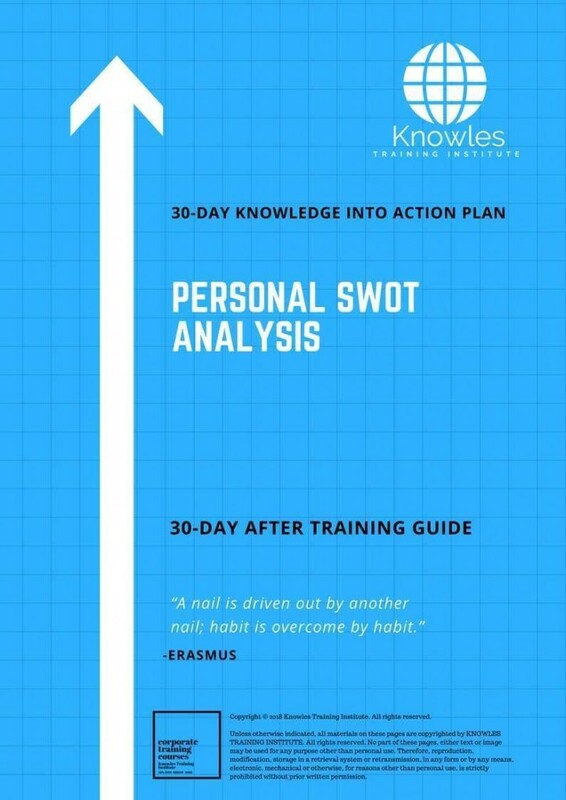 Share This Personal Swot Analysis Training Course! Personal Swot Analysis course, workshop, training, class, seminar, talk, program, programme, activity, lecture. Personal Swot Analysis courses, workshops, classes, seminars, talks, programs, programmes, activities, lectures in Singapore. Personal Swot Analysis improvement tips, Personal Swot Analysis techniques, improve Personal Swot Analysis, improve Personal Swot Analysis games, Personal Swot Analysis improvement exercises, improve Personal Swot Analysis power, how to have good Personal Swot Analysis, how to have good Personal Swot Analysis in studying, how to build up your Personal Swot Analysis, how to improve Personal Swot Analysis how to improve Personal Swot Analysis course in Singapore. 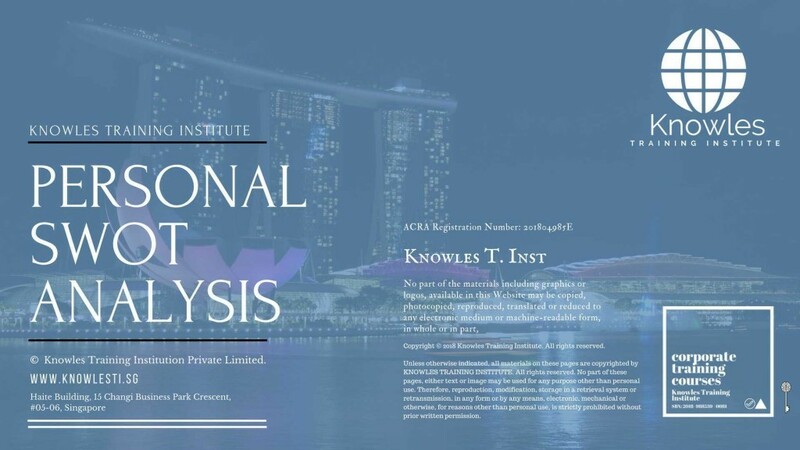 Enhance, boost, build up, enlarge, heighten Personal Swot Analysis course in Singapore. Increase, intensify, raise, reinforce, strengthen Personal Swot Analysis. Upgrade, amplify, boom, elevate, exaggerate, magnify, grow, gain Personal Swot Analysis. 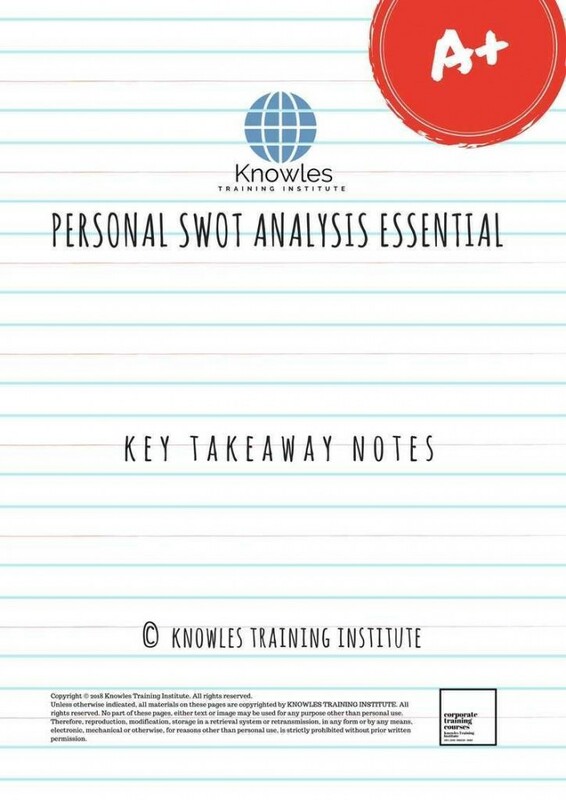 Develop Personal Swot Analysis, multiple, power up, beef up, bolster, establish, extend Personal Swot Analysis. Invigorate, restore, step up, toughen, empower, fortify, regenerate Personal Swot Analysis. 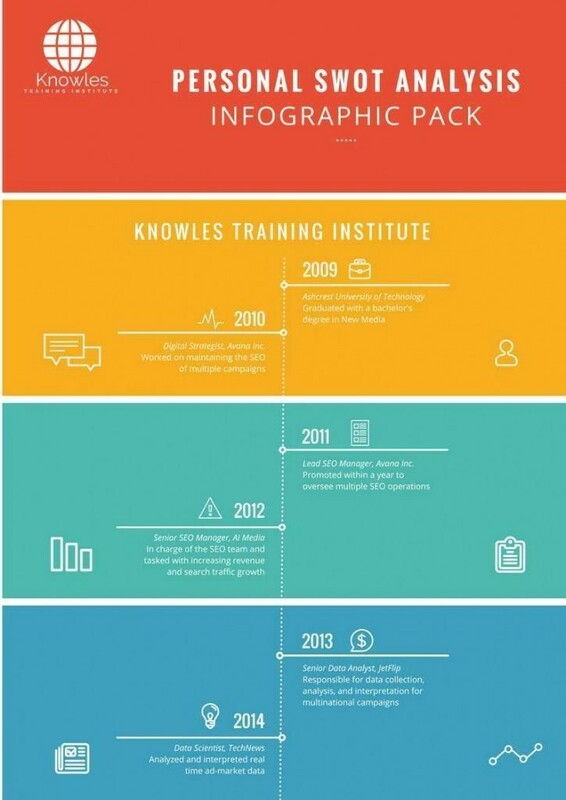 Rejuvenate, renew, escalate, expand, maximize Personal Swot Analysis. Powerful, mighty, impressive, competent, great, excellent, exceptional Personal Swot Analysis in Singapore. Superb Personal Swot Analysis. Super, superior, strong, solid, active Personal Swot Analysis training courses and workshops in Singapore. Personal Swot Analysis enhancement, booster, building up, enlargement, heightening, increment, strengthening, amplification. Personal Swot Analysis magnification, growth, development, power, empowerment, regeneration. Personal Swot Analysis rejuvenation, development, escalation, expansion. 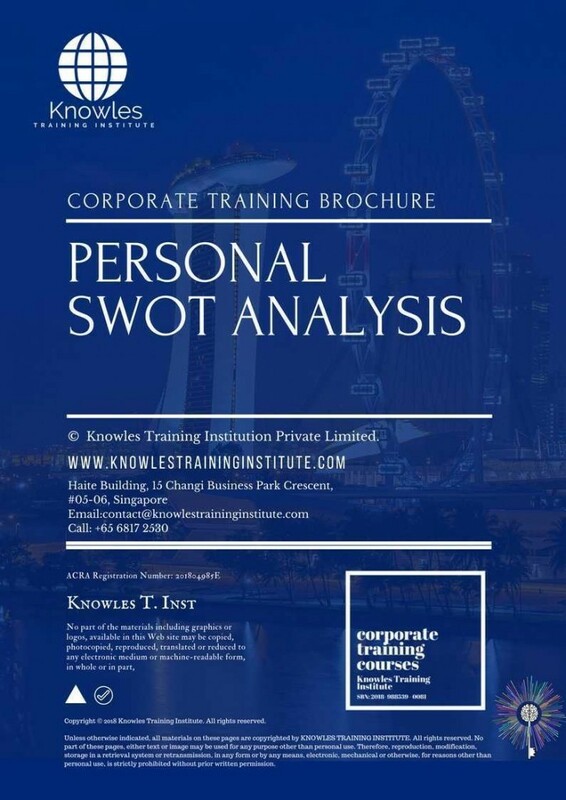 Personal Swot Analysis maximization, power training courses & workshops in Singapore.